- Oral histories, including audio and video- which have been digitized and are available to view/hear at the click of the mouse. - Subject and biographical files gleaned from information from such media as newspaper clippings, magazine articles and family histories related to Steamboat Springs. Please call the museum at 970-879-2214 to make an appointment to visit the research center (Monday-Friday, 9-5pm, Sat. 11-5). When you visit the center, our staff will be happy to help you get started with your research. If you are out of town and can not visit the research center, our staff can assist you for a fee of $15 per hour with a $15 minimum. Special thanks to Don Lufkin and the Lufkin family for funding the remodel of this resource facility and archive and assisting in its ongoing improvements. Do you have information? 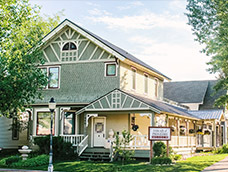 The museum welcomes your contribution of information and artifacts about the Yampa Valley. Add to or create your local family's file and help keep the museum an imporant resource for future generations. Contact our Curator Katie Adams at 970-879-2214 or kadams@treadofpioneers.org. Other reseach sources are available on the History and Genealogy page of yampavalley.info: Click here to link to the page. Colorado Birth, Death & Marriage Cert. as well as links to county-wide historical organizations, libraries and much more.